An Egyptian chemistry expert sought by police over the London bombings has been arrested in Cairo, Egypt. 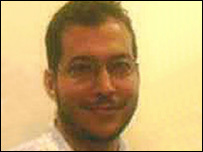 Magdi Mahmoud al-Nashar, 33, had not been seen by colleagues at Leeds University since early July. British police are searching a house in Leeds linked to Mr al-Nashar, but have not formally named him as a suspect in their investigation. Mr al-Nashar denied having any role in the attacks and said he was on holiday, Egypt's Interior Ministry said. He told investigators all his belongings remained in the UK and he planned to return there, it said in a statement. British police are hunting the financiers, supporters and chemists who assembled the bombs which killed 51 people in London on Thursday. Three of the four bombers are also confirmed dead, and the fourth bomber is also thought to have died. Agents are understood to be with Egyptian authorities in Cairo, questioning Mr al-Nashar, who was arrested on Friday. His alleged link to the plot is unclear, but it was believed he handed over keys to a house in Leeds used by the bombers, said BBC security correspondent Gordon Corera. He has completed a PhD in chemistry at Leeds University. Police are still searching homes in Leeds and Buckinghamshire. A community centre and Islamic bookshop near the home of one of the bombers, Shehzad Tanweer were also searched and computers seized from the centre. 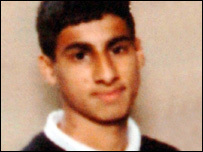 Hasib Mir Hussain(confirmed): Aged 18, lived Holbeck, Leeds. Reported missing on day of bombings. Said to have turned very religious two years ago. ID found in No 30 bus. Shehzad Tanweer(above): Aged 22, born Bradford, lived Beeston, Leeds. Studied religion in Pakistan. Forensic evidence linking him to Aldgate blast. Lindsey Germaine: Jamaican-born man who lived in Buckinghamshire. Explosives made from ingredients available from high-street chemists were found in one of the homes in Leeds, sources have told the BBC. They were the same kind of explosive Richard Reid had in his shoes when he tried to blow up a trans-Atlantic flight in 2001. The BBC has also learned a suspected al-Qaeda member entered Britain via a Channel port two weeks before the bombs, but was not kept under surveillance. The man apparently left Britain hours before the blasts. Met Police commissioner Sir Ian Blair said there was nothing connecting the man to the plot, but added that investigators expected to find evidence linking al-Qaeda to the attacks. He said the four bombers were only the "foot soldiers" of the operation and the mastermind was still being sought. "What we've got to find is, who encouraged them, who trained them, and who's the chemist," he said. He said police would also work with the Muslim community, which he said had been "close to denial" about extremist preachers, to defeat terrorism. Muslim community leaders including Sir Iqbal Sacranie, secretary-general of the Muslim Council of Britain (MCB) visited mosques, charities and schools in West Yorkshire on Friday. The MCB delegation met with relatives of one of the suicide bombers, Mohammad Sidique Khan, in Dewsbury. Fifty-one people are confirmed as having died in the attack. Three of the bombers are confirmed dead, with the fourth also thought to have died. The names of two bombers - Hasib Mir Hussain, 18, from Holbeck, Leeds and Tanweer, 22, from Beeston, Leeds - were confirmed by police. Khan, 30, from Dewsbury, West Yorkshire, is believed to have blown up the Edgware Road train, though no forensic evidence as yet places him at the scene. Police sources indicated the fourth bomber was almost certainly Jamaican-born Lindsey Germaine, who lived in Buckinghamshire. On Thursday, police revealed a CCTV image of Hussain. They want to know if he received last-minute orders to change his plans. Forty-one bomb victims have been identified and 31 named. The first funeral for one of the victims took place. 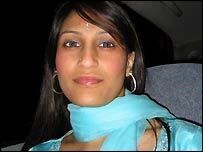 Shahara Islam, 20, from Plaistow, east London, was buried at a private service. The government plans new criminal offences of providing or receiving training in the use of hazardous substances; of acts preparatory to terrorism; and of inciting terrorism indirectly, Home Office minister Hazel Blears said. It emerged bomber Mohammad Sadique Khan, a teacher, met MPs Hilary Benn and Jon Trickett during his school's trip to the Palace of Westminster in July 2004. Victoria Line tube trains began to call at Kings Cross for the first time since the bombings.